June 26th, 2007 | Author: Dave Q. So my buddy Brian threw a surprise 30th birthday party on Saturday night for his wife Mary Kate. A nice sized group was there to celebrate. Plenty to drink. Excellent food. Good music (until Nick put in his Celine Dion’s Greatest Hits cd). Even got to enjoy a cigar. But the obvious hit of this party was Japanese. Yes, I’m referring to the Nintendo Wii. And now I want one. Here’s Spray getting the digital crap kicked out of him in boxing. Brian got the Wii about 2 weeks ago and has been raving about it ever since. Everybody enjoyed it. We bowled. Played tennis. Golfed. Played home run derby. I was impressed! So the Wii has now made it on my list of things to buy. One negative thing to note. You know how I’ve had a sore right shoulder for a couple of weeks? And of course I’ve been meaning to go to the doctor about it but due to my stubborness/laziness have yet to make an appointment. Well, when doing the home run derby on the Wii Saturday night, I tweaked it again. The damn thing was starting to feel better too. So, take this advice. 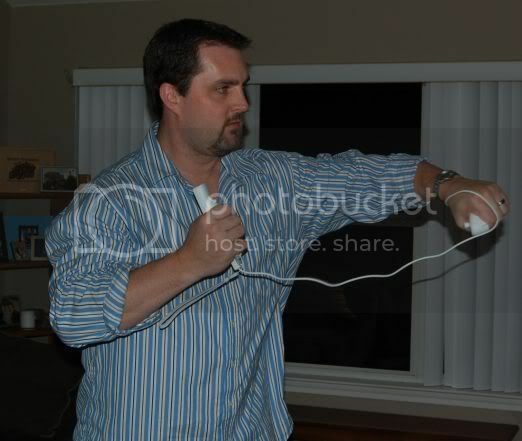 Don’t jack with the Wii when you have a jacked up appendage. Out!